thin crust pizza 1, originally uploaded by All Things Mimi. It seems like most of my adult life has been spent in pursuit of a thin crust pizza dough recipe I can make at home, and pretend I'm sitting outside at Vinnies on a perfect spring day. Well, the best run I've made at it so far was really nothing new. I just did something a little different. But instead of rolling it out after 5 minutes like I normally do, I let it rest for about 30 minutes (while I made sauce and chopped toppings), then I cut the dough into 2 pieces. I rolled each piece out as thinly as I could. I managed to get 2 large pizzas out of that one recipe of dough. When I say large, I mean at least 16 inches across. I docked each piece of dough and pre-baked them separately on a pizza stone in a 450 degree oven for about 7 minutes before I topped them. This time around I used spinach, fresh tomato, feta and mushrooms as my topping. Dev added canadian bacon to his. The resulting pizza was thin and crispy and perfect. I will use this technique from now on. 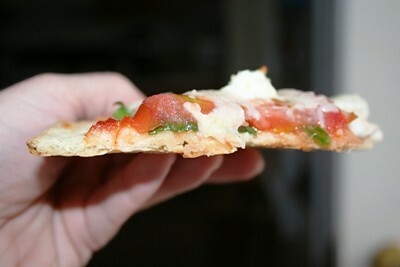 Love thin crust pizza too. Have my own dough recipe but am still searching for more. Got to try this one.